When welcoming a baby earth side, there are literally thousands of things you could buy that make the transition easier on parents. One item that is very important for health, safety, and comfort is a good infant car seat. You’ll quickly realize that you can’t take your baby anywhere without one – including home from the hospital after their birthday. And with over thousands of options to pick from, choosing a car seat can quickly get overwhelming. Rest assured, every new car seat today must pass government safety standards, so buying a less expensive car seat doesn’t mean it’ll be less safe. You also have to think about car seat safety laws that are constantly evolving and that differ with each state. Another thing to keep in mind is you want your car seat to be compatible with your stroller. Even though you have a million-and-one decisions to make, we’ve got you covered by putting together the best infant car seats available on the market today. The Chicco KeyFit 30 Infant Car Seat is one of the top rated car seats today and for good reason. If your plan is to move baby between multiple cars, this car seat is a winner. With fast and easy installation features, like a quick-release base, the Chicco is a great option for parents looking for simple features and a safe quality structure. A bubble-level indicator tells you if the base is installed at an accurate angle. The one-pull latch tightener helps achieve a secure fit into the car with a fraction of the effort. You also know your baby will be comfortable with plush (and safety tested) padding and fabric that helps support and cradle your baby’s cute little body. The car seat also has a five-point harness that can be tightened with one hand, as well as an infant insert for smaller babies that weigh between 4 and 11 pounds. Installation is easy as the Chicco KeyFit secures with an audible “click” into the base. In addition, the car seat can be removed from the base with one hand. The weight limit is 4 to 30 pounds, so it’s sure to fit your baby from day one up until toddler-hood, when you may need to buy a new toddler car seat. Another plus about Chicco is that it’s such a popular brand, so finding a compatible stroller isn’t difficult at all, as it’s compatible with Chicco Bravo, Cortina, Neuvo, TRE, Activ3, Cortina Together, Liteway Plus, and KeyFit Caddy strollers. One downside is that the base of the Chicco KeyFit is a little larger than other car seats making it harder to fit into tight vehicles. 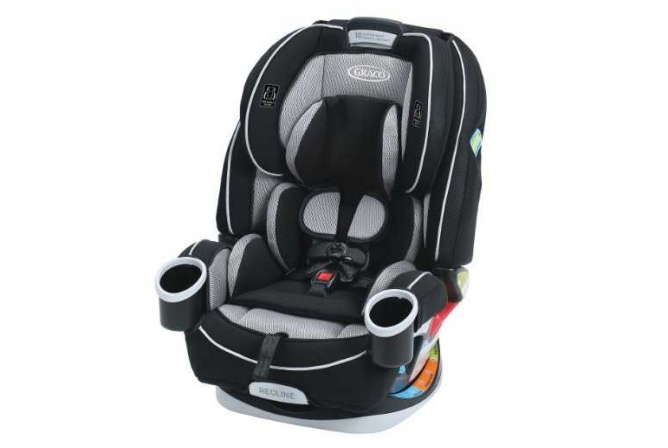 MSRP is $199.99, but check the current Chicco KeyFit 30 Infant Car Seat – Amazon price. The innovative and thoughtful design of the Peg Perego Primo Viaggio 4/35 Infant Car Seat is truly like no other. This car seat is made in Italy and was designed with extreme thoughtfulness and safety, as most European baby gear is. It comes with adjustable side impact padding that grows with baby, and the material is made of a plush jersey fabric that is super comfortable for baby. The five-point shoulder straps are adjustable WITHOUT the dreaded re-threading that comes with most car seats. Peg Perego also is one of the rare car seats that comes with an anti-rebound safety bar, a standard in Europe but not yet in the U.S. that can help reduce injury to baby in the case of a crash. The weight limit for this car seat is 4-35 pounds, and the height limit is 32 inches, a bit beyond other car seats. And let’s just talk about how gorgeous the Peg Perego is, with smooth clean lines, cute modern designs, and quality stitching. It’s understandable why some are willing to pay the extra buck for this designer-type car seat. The Peg Perego does come with a click-in base that stays locked in the car for fast and easy transport. However, this car seat is a little heavier that others on the market. 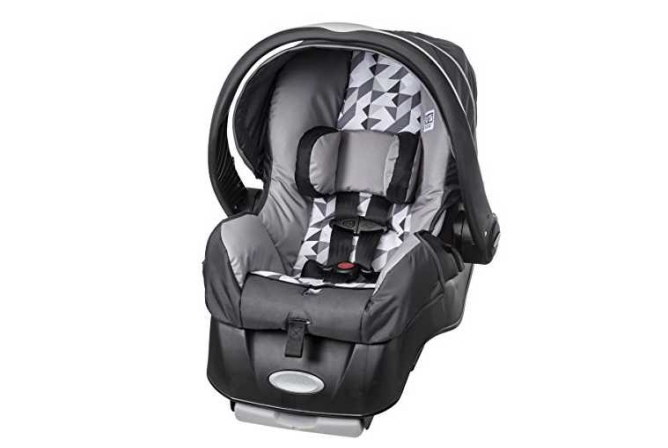 The MSRP is $299.99, click here to find the current Peg Perego Primo Viaggio 4/35 Infant Car Seat – Amazon price.You’ll feel like an Italian designer custom-made this safe and stylish car seat just for your family when you buy Peg Perego. Graco is one of the most popular brands for affordable and safe baby gear, and parents are completely happy with the features and design that this brand offers. The Grago SnugRide Click Connect 35 is a step up for Graco’s Click Connect 30, and it has a few new design features that make 35 better than previous Graco models. The Click Connect 35 has a base that can be easily installed in any car, and notifies you when the car seat is secure with an audible “click”. Weight limit is between 4-35 pounds, and the height limit is a little above average, topping out at 32 inches. What makes this car seat so easy to use is the simple design and easy features. It’s super easy to move from car to car, has a comfortable handle, is lightweight, and gets the job done. Safety is also a plus, as the SnugRide is crash tested to meet or exceed crash test standards. 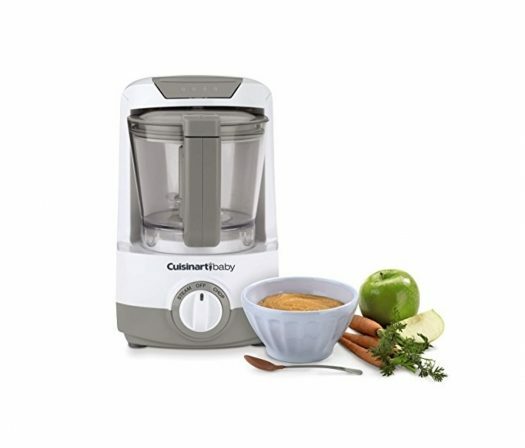 The infant insert is easy to remove and helps support babies that are 4-11 pounds. It’s also compact and can fit in smaller cars. Some complaints are that it doesn’t fit babies that are a little broader (bless their little rolls!) and the fabric isn’t as breathable as other car seats. 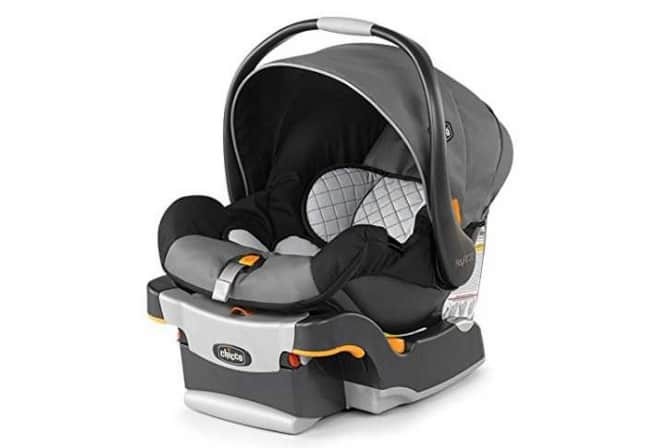 MSRP for the SnugRide is $130 but check out the Graco SnugRide Click Connect 35 Infant Car Seat – Amazon price right now. Although the Graco 4ever All-in-One Convertible Car Seat can perform as an infant car seat, this baby can double (or quadruple) its use as your little one grows. It starts out for infants with an infant insert and padding that supports their little bodies and can be used rear-facing from 4-40lbs. The 4ever All-in-One then transforms into a front-facing toddler seat, followed by a high back booster and backless booster for older kiddos that aren’t quite ready for a seatbelt. Safety and quality is a top feature with this car seat. A level bubble indicator helps to ensure a safe installation. The fabric is soft and supported by energy-absorbing EPS foam which is THEN backed by a steel reinforced frame. With an adjustable base that has 6 recline positions (3 rear-facing and 3 forward-facing) and a no-rethread 10-position headrest, this little car seat is sure to be your new BFF. One downside to having this car seat as an infant car seat is the huge convenience of being able to carry your newborn IN the car seat. This seat has no handle and can’t be carried around with baby in it. Also, for smaller cars and sedans, the All-in-One might be a tighter fit when used as a rear-facing seat. However, if you’re looking to save money and space in the long run, and want to avoid purchasing more than one car seat for your kiddo, the All-in-One might be a great fit. 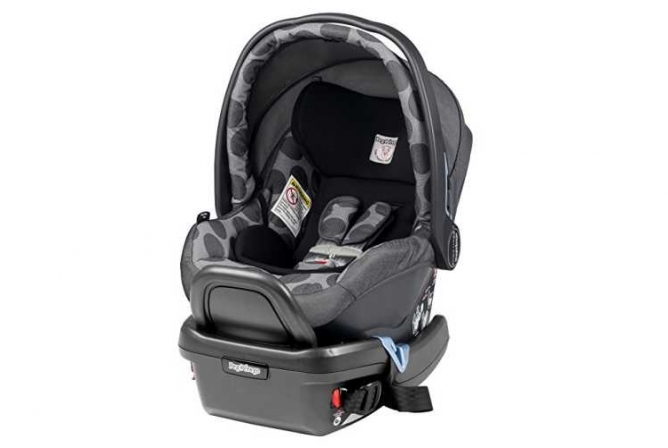 The MSRP is $299.99 but check the Graco 4ever All-in-One Convertible Car Seat – Amazon price here. This car seat truly is a one-of-a-kind and has a ton of versatile and features to fit your family’s needs for a long time! If you like the idea of a convertible car seat, find some top convertible car seats here. If you’re on a tight budget but don’t want to skimp on safety and ease, then the Evenflo Embrace LX will make your Benjamins dance. This affordable little car seat has an easy click system similar other infant car seats. It comes with a base that stays in your car, and all you need to do is pop the car seat right in and go. Safety tests are done at two times the federal crash standards. Also, this little seat is 25% lighter in weight than most car seats, so you’re getting lightweight design without skimping on safety. The fabric is easy to clean, but some parents complained about their babes getting hot while in the car seat (similar to the Graco SnugRide) so it isn’t very breathable. This little seat has a weight limit for babies between 4-35 pounds, so it’s sure to last through your baby’s first years until they may need a toddler car seat. Another downside with this car seat is the smaller canopy, which helps protects your baby from the elements while traveling. 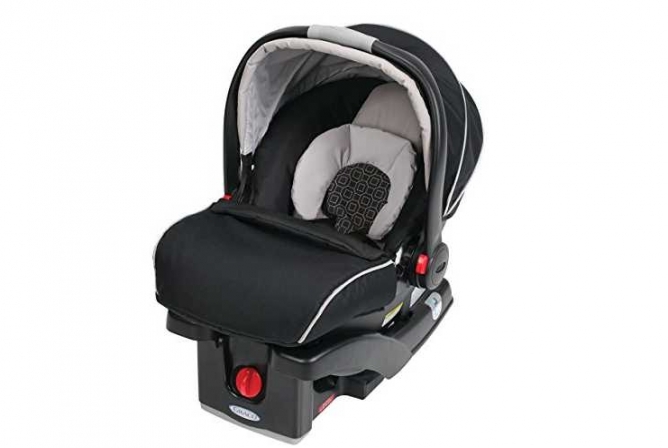 With an MSRP of $99.99, check the Evenflo Embrace LX Infant Car Seat – Amazon price here. Overall, the Embrace LX is a perfect little budget saver that will keep your baby safe and cozy. Before you rip tags and stickers off your car seat, make sure it fits well in your vehicles and is comfortable for your baby. Remember that any new car seat you buy today will be safe. What you have to decide is what will work best with your family’s needs. It’s important to make traveling easy and comfortable for you and your baby. Once you’ve picked out our newborn’s car seat, head over to our Newborn Essentials article to find the best products for welcoming a newborn into the world! Also, if you’re interested in saving money and buying just one car seat for your baby’s entire life, check out our best convertible car seats.